Noted for its rich use of ornamental domes and colorful mosaics, the Byzantine style of architecture has found new life. Perhaps no other single style of architecture combines ancient ecclesiastical forms with sacred artworks as lavishly as the Byzantine. The style developed during the Byzantine Empire (500 A.D. and thereafter) and is characterized by complex vaulting with domes, large open spaces, and lavish decoration with mosaics, gilding, and paintings of Christian subjects. In 323 A.D., Constantine the Great moved the capital of the Roman Empire to the Greek town of Byzantium and established a formal culture of Church and State. Byzantium was renamed Constantinople (present-day Istanbul) and became the seat of this ecclesiastical government. Today, the term “Byzantine” refers to the entire Eastern Roman Empire and Byzantine art represents the final, Christian stage of antiquity. The relocation of the capital to Byzantium resulted in the division of the Roman Empire by the beginning of the 5th century, followed by a religious split: the Eastern, or Orthodox Church, was headed by the Emperor and his appointed patriarch; and the Western, or Catholic church, was headed by the Bishop of Rome and separate from the powers of the State. Early Christian architecture, the first constructed expressions of the new faith in Constantinople, was based on a new building type called the basilica. The form and use of this building, derived from Roman courthouses, became the basic model for western medieval church architecture and remained important in Byzantine architecture. The basilica form featured a rectangular nave with columns supporting a pitched roof; an altar and apse at the east end; and an atrium or narthex at the west end, often with an exonarthex (an open porch with columns). Constantinople was the source of inspiration and guidance for the Orthodox Christians of the Byzantine Commonwealth, which included Asia Minor, the Balkan states, Greece, eastern Italy and Sicily; it also influenced Slavic, Carpatho-Russian, and North African cultures. Furthermore, Byzantine art, at its zenith when the Romanesque style emerged in Europe, permeated Romanesque ornament and even intermingled with Celtic art in Scotland and Ireland. The Byzantine style is characterized by the dome and the cruciform shape, round arches, and circular windows. Buildings are formal and symmetrical, with compact, functional plans. Exterior walls are smooth and plain. Popular materials include buff brick in large, flat sizes; light-colored stone, often in bands; and stucco or plastered and painted concrete. Interiors strive for a dematerialized effect, with floating domes over open spaces, ethereal light, and shimmering mosaics or gold leaf. Iconographic murals are typical. Ornament is inspired by historical precedent, often reinterpreted in an original manner. Carving is simple, in bas-relief. In the Episcopal Chapel in Ravenna there is an inscription that reads: “Whether born here or held prisoner here, in this place light reigns freely.” The only technical advantage mosaic has (that of humidity resistance) is not enough: glass mosaic’s real advantage lays in its relationship to religious symbolism in the Christian aesthetic. 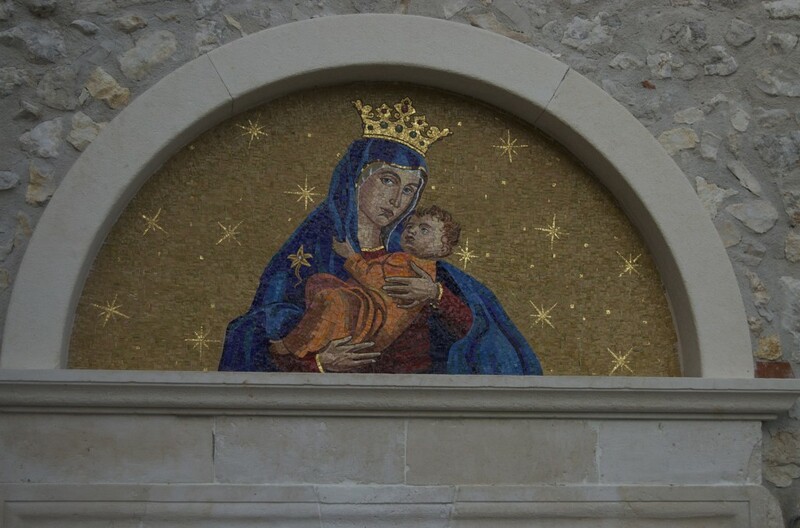 Glass and gold mosaic’s durability and brightness make it a natural choice when decorating the walls and vaults of Catholic, Anglican, Orthodox and other churches. The use of precious gold and the highly-reflective surface of gold tesserae are extremely effective at enhancing light, a quality highly prized in Byzantine art. Its durability and an almost infinite number of color gradations – over 28,000 different hues and shades – make mosaic the ideal choice to replace oil painting or frescoes, maintaining its vivid colors and clear lines over centuries. An important innovation of Byzantine mosaic art, as the Byzantine mosaics of Ravenna from the fifth century AD show, was that it was no longer necessary to ensure a perfectly flat surface such as was needed for walking on. The glass tesserae and the newly introduced gold tesserae were affixed directly in place on walls and arches, and were deliberately set at varying angles in order to reflect light. So, along with the element of color, we now have the element of light. The stimulating effect of color reinvigorated by the play of light remains one of the fundamental objectives of a mosaicist. The Byzantine mosaicists were masters of this technique. It is crucial that all the many tiny pieces, inserted by the mosaicist to make the whole, acquire the property of reflecting light. Just as the heavenly bodies in space reflect the sun’s light, the tesserae give the impression every hour of the day of being sources of light themselves, and in fact, having absorbed the light, radiate it back out to illuminate a dark space. Anyone who has entered the tomb of Galla Placidia in Ravenna knows what I am talking about. Enzo can execute mosaic portraits of saints and Madonnas which are noted for their ability to reflect light skillfully and beautifully. One example of his work is the wonderful 60-sq-foot glass mosaic “Mater Ecclesiae”, created to decorate the bell tower of Saints John and Paul Catholic Church in Sewickley, near Pittsburgh, Pennsylvania, USA.